1994 - 2000 Studies of Fine Arts at HdK Berlin and Kunstakademie München (Painting, Video, Performance), Diploma 2000, Prof. Klaus vom Bruch. 1999 - 2004 Studies of Classical Indian Dance Bharata natyam, R. Ramesh Academy for Performing Arts, Berlin. Intensive-Studies in India. Solo-Performances and Solo-Exhibitions (Choice): Indian Embassy, Berlin; International Festival of Arts, Bangalore, India; Gallery Weißer Elefant, Berlin; Ethnological Museum, Berlin; Intercultural Week, Erfurt; aspekte gallery Gasteig, Munich; Shivaratri-Festival, Bangalore, India. Publication of cartoons in magazines and newspapers: Junge Welt, Szene Hamburg, Ab 40, Edition wasser im turm. This game becomes especially amusing, when the players are known to the audience, like VIP´s, or the couple at a wedding. You tell us, for which occasion you need the interactive game. Carolin Gödeke will then develop a concept perhaps with special images. She is also able to work as a moderator. 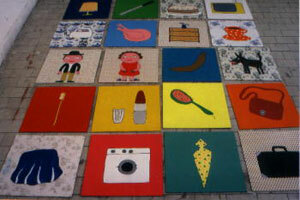 The game shown here, consists of 20 wooden plates, each sized 40 x 40 cm.